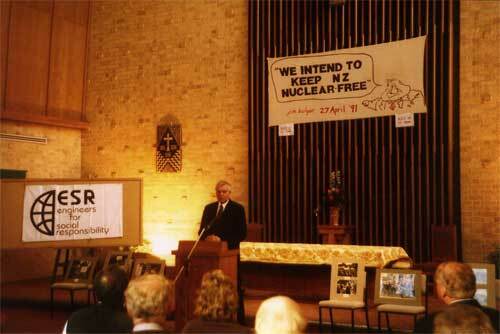 Twenty years after the Nuclear Free legislation was passed we gathered to celebrate. Bob Harvey was one of the speakers." In 1985 Visual Artists Against Nuclear Arms painted a large mural. In 2006 it was recreated and fragments of the old mural were dismantled, reworked by the original artists, and put up for auction to raise money for the Peace Foundation.